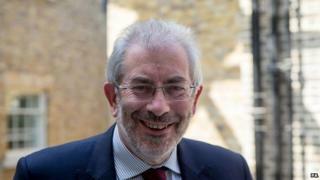 The head of the civil service, Sir Bob Kerslake, is to step down from the job. Cabinet Secretary Sir Jeremy Heywood is to take on the role - two years after his existing role and the head of the civil service were split. In his current role, Sir Jeremy reports directly to the prime minister on a range of policy issues. As part of the shake-up, Sir Bob will also retire as permanent secretary at the Department for the Communities and Local Government early next year. The move comes amid a row earlier this month over the responsibilities and duties of the civil service after the minister with responsibility for the civil service, Francis Maude, accused senior officials of drafting a job description for permanent secretaries without "constitutional propriety". The BBC News Channel's chief political correspondent Norman Smith said Mr Maude was staying in his post after Tuesday's government reshuffle but had been told to "accelerate" reforms to streamline the civil service and make it more responsive to ministers' needs. In a blog post after his departure was announced Sir Bob said that since joining the civil service in 2010: "My abiding impression is of the commitment, integrity and ability that civil servants bring to their jobs. "The last four years have been challenging, with staff reductions, pay restraint and pension changes but I believe the Civil Service has delivered brilliantly on a massive programme of change for the government." He also said: "Less brilliant have been the 'noises off' criticising civil servants and accusing them of being reluctant to change. Such criticism is deeply unfair and I hope that I have done my bit to challenge it. You can though, be its biggest advocates, talking with pride to your friends outside about what we deliver on a daily basis." The roles were split between the two senior mandarins after Sir Gus O'Donnell retired as both Cabinet Secretary and Head of the Civil Service in 2012. The Institute for Government said the shake-up gave the prime minister the opportunity to "correct past mistakes" and put in place a "long-term leadership structure" at the head of the civil service. "The role of the head of the civil service is important for the effectiveness of government and for the successful delivery of the prime minister's priorities," said its director Peter Riddell. "The position carries enormous responsibilities and is a full-time job that requires a full- time appointment, separate from the cabinet secretary." Mr Riddell said that asking Sir Bob Kerslake to do the job while also retaining day-to-day responsibilities for a government department was a "mistake" and should not happen again.